The Cornish Lady is a part of The Cornish Saga, but the book is stand-alone’s so you don’t have to read the previous books, unless you want to of course! I had to check this before I started the book since I was a bit unsure. I was quite pleased when I discovered it was a stand-alone since that made it easier for me (pssst I have enough books to read, but don’t tell anyone!) I was intrigued by it very early on because what seems like an innocent story quickly proves to be nothing but! This book is filled with the kind of action that is perfect when you need to drift off into a story. The Cornish Lady has a great story that flows exceptionally well. It’s almost perfectly parted into action and slower parts, neither being too long or too short. This, of course, depends on the reader, but for this reader, it was almost perfect. Some parts were a bit slow in my opinion, but they didn’t stand out too much since I was so invested in the story. I’ve only reflected on this after I finished reading the book. The characters in The Cornish Lady is colourful in the way only British 1700 century characters can be. I have to say that I had a mini crush on the main male character, Henry Trevelyan, and he has the most amazing background, but I’m not spoiling that for you! Angelica Lilly, our female main character is full of spirit and I love to see how she breaks out of her shell during the story. She’s a great example of how women, back in those times, weren’t beneath men when it came to handling business affairs, and there are also other characters in this book who can prove that point. Another this I appreciate with this story is that it’s not too many characters. There is a list in the front of the book explaining the characters relate to each other, but it is also mentioned the first time the character enters the story, which makes it even easier to remember everybody. There is a core of main characters, and then there are some minor characters as well. The feelings in this book run rather high at some points during the story, and it is very well complimented with Pryce’s description of the surroundings of the story. She’s very good at portraying the physical surroundings as well as emotions, clothing and people’s appearances. These descriptions really pull the reader in from the very first page and keep you engaged throughout the story. 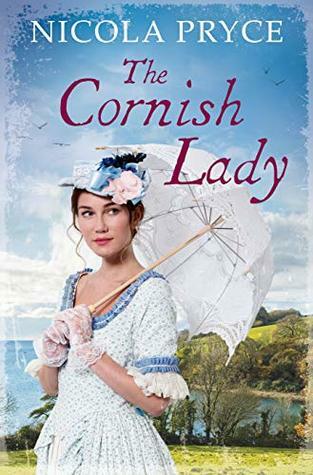 The Cornish Lady is a nice and relaxing read. While reading you can let your brain float along with the story. This book is very well suited as a relaxing Sunday read. How historically accurate it is I cannot say, but that’s what nice about historical fiction, you never know, and you can let your imagination wander. I will be keeping an eye open for further and previous books from this author. Nicola Pryce came to writing after a career in nursing. She has an Open University degree in Humanities and is a qualified adult literacy support volunteer. She is lives in the Blackdown Hills in Somerset and when she isn’t writing she’s probably gardening or scrubbing the decks. She and her husband love sailing and for the last twenty years they have sailed in and out of the romantic harbours of the south coast of Cornwall in search of adventure: it is there where she sets her books. Nicola is a member of the Romantic Novelists’ Association and The Historical Writers Association.